This quote which I found on Pinterest kind of smacked me in the face. You see, sometimes, I am not very patient. Ok, a lot of times, I am not very patient. So reading this quote, I thought back to all of the times that I was about to lose patience with either a person, a situation, or any other thing that irked me. There are many, many times that fall into that list. And then, I thought of how patient God is with me; all the times I must do things that incredibly annoy Him. Ohhh, He has been so patient with me. 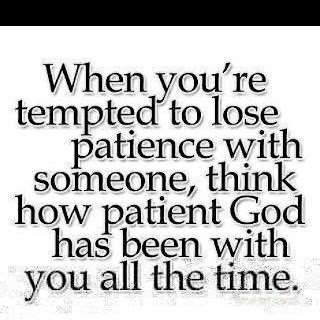 If I would try to imitate how patient He is with me, I would never lose my patience or temper again! While it's an impossibly lofty goal to think that I might never lose my patience again, I like this quote. It's good food for thought, to keep in mind when I find myself feeling that telltale rise of irritation in my body, and my blood starts to boil just a little bit. God is infinitely patient with me. If I can be 1/1,000,000th as patient as He is, what an improvement that would be!